After two years of trial sessions, and three years after the case was first brought before the Cairo Criminal Court, Judge Hassan Farid issued a verdict in the Rabea sit-in dispersal case on Saturday morning, according to lawyer Karim Abdel Rady. The sentences Farid handed down to the 734 defendants on Saturday, many of whom have been held in remand detention far beyond the two-year maximum, were wide ranging. Seventy-five Muslim Brotherhood leaders who received preliminary death sentences at the close of July were given final sentences in today’s ruling, and the majority of defendants were given lengthy prison terms. However, due to the five years spent in remand detention counting as time served, some of the five-year sentences handed out to 215 defendants — among them freelance photojournalist Mahmoud Abu Zeid, more commonly known as Shawkan — came as a welcome end to their protracted and illegal detention. Following the recent ruling, we map out the details of the case, which spanned almost five years in total and was burdened by the large number of defendants, delay tactics deployed by some of those on trial, bureaucratic hurdles and the case’s historical significance. On August 14, 2013, police troops supported by military forces were deployed to forcefully disperse tens of thousands of protesters expressing support for the Muslim Brotherhood-affiliated former President Mohamed Morsi at the Rabea al-Adaweya and Nahda squares. The violent dispersal left 607 protesters and eight police officers dead, according to figures published by the June 30 fact-finding committee founded by interim President Adly Mansour, although other organizations have presented significantly higher figures. The following day, the East Cairo prosecution initiated an investigation into the events of the dispersal. After two years of investigations, the prosecution referred a total of 739 defendants to the Cairo Criminal Court in August 2015. Several defendants in the case are prominent members of the banned Muslim Brotherhood group and its affiliated organizations and parties, including the Brotherhood’s Supreme Guide Mohamed Badie, politician and leader of the Freedom and Justice Party (FJP) Mohamed al-Beltagy as well as leading Brotherhood figure Essam al-Erian. Politician and FJP member Bassem Ouda, Brotherhood Guidance Bureau member Abdel Rahman al-Barr, Jama’a al-Islamiya leaders Tarek al-Zomor and Assem Abdel Maged, Wasat Party Vice President Essam Sultan, former Youth Minister Osama Yassin, son of the detained former president Osama Mohamed Morsi, as well as Islamist preachers Safwat Hegazy and Wagdy Ghoneim are among those included in the case. Also in the list of defendants is 28-year-old freelance photojournalist Shawkan, who was arrested while working for British photo agency Demotix. According to published investigations, Shawkan’s charges include membership to an outlawed group (in reference to the Muslim Brotherhood), murder, use of force and violence, threatening public security and “killing and wounding several policemen,” all of which he has denied. The first trial session took place on December 21, 2015, two years after the start of the investigations. During this session, the court decided to adjourn until authorities made arrangements for a bigger defendant’s cage to accommodate the large number of people on trial, a procedure the defense protested. The trial took place over more than 50 sessions, Arabic Network for Human Rights Information (ANHRI) lawyer Nour Fahmy tells Mada Masr. The court began the listening to the prosecution’s and defense’s arguments on March 3, 2018, holding two sessions a week thereafter to do so, which usually took place on Saturdays and Tuesdays, according to Fahmy. These biweekly sessions continued until May 29 of this year, when the court announced that the verdict would be issued on June 30, a date that has been postponed twice since. The prosecution demanded that all 739 defendants be handed death sentences, while the lawyer of seven defendants pushed for the illegality of the prosecution’s investigations during a session on March 31, arguing that the defendants were referred to investigations 24 hours after their arrest and that they were interrogated outside of the prosecution’s headquarters without their lawyers. Another lawyer, who represents 15 of the defendants, pushed for his clients’ acquittal, citing illegal arrest procedures, and demanded that former Minister of Interior General Mohamed Ibrahim redeliver his testimony to the court, which had been heard during a closed-door session out of court. Another point of contention between the prosecution and the defense concerned the number of deaths that resulted from the sit-in dispersals, as the former only counted deaths that occurred among police forces, excluding protestor fatalities. December 21, 2015: The first trial session was held after more than two years of investigations into the case. May 10, 2016: This was the first session in the case in which evidence — including a number of machine guns, shotguns, pistols and ammunitions — was exhibited. The defense argued that the defendants had nothing to do with the evidence. 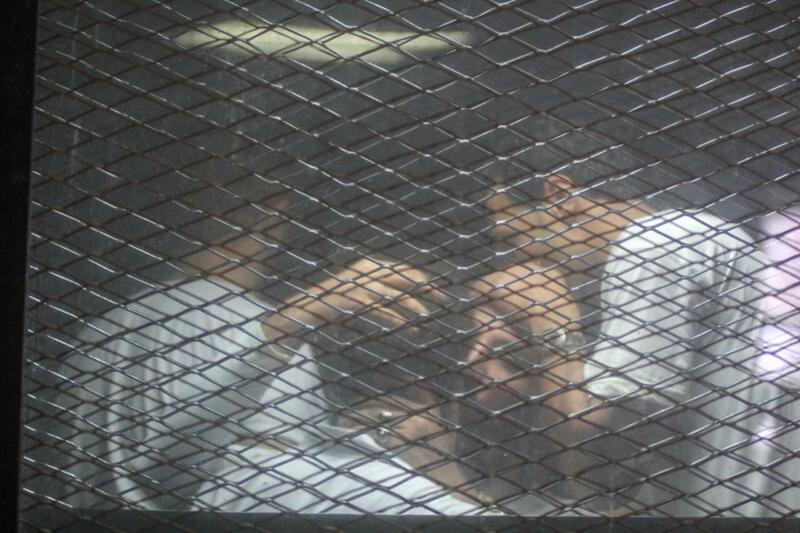 In the same session, the court allowed defendants Beltagy and Sultan to talk and both protested the glass defendant’s cage, arguing that they could not hear the trial. “There can’t be a defendant who is unable to listen to his own trial, to know what case he is being accused in, to know the judge presiding over the case,” Sultan said. The session also witnessed Beltagy accusing former Minister of Interior General Mohamed Ibrahim and former Interim Prime Minister Hazem al-Beblawi of killing his daughter Asmaa during the dispersal. October 8, 2016: Judge Hassan Farid ordered the release of a cancer patient and defendant Hosni Ali. December 10, 2016: Following his arrest earlier that month, Osama Mohamed Morsi, son of the detained former president, appeared in court for the first time. Prior to his arrest, Osama was vocal in calling upon international human rights organizations, the United Nations foremost among them, to condemn what he described as violations committed by the Egyptian regime against his father. May 20, 2017: The court announced that it had received a report from the General Intelligence Service, in which the agency denied having any CDs containing footage of the dispersal. October 7, 2017: A secret session took place where the testimonies of former Cairo Security Director General Osama al-Saghir, as well as Generals Alaa al-Din Bashandy and Tarek Mahmoud were heard. October 17, 2017: During the session, Brotherhood leader Erian demanded the appointment of international lawyers to the defense team. In the same session, Sultan, the vice president of the Wasat Party, announced that he would go on hunger strike until a United Nations committee investigated his claims that he had been tortured in custody. October 24, 2017: The court heard the testimony of Major General Ashraf Abdallah, who was the assistant interior minister in charge of the Central Security Forces during the dispersal. He testified that police forces were assaulted once they reached the sit-in and that four officers and one conscript were killed in the first minutes of the dispersal. February 24, 2018: The New Arab news website published eight demands presented by Brotherhood leaders Erian, Beltagy, Yassin and Sultan. One of the demands was to screen the main piece of evidence, a CD containing unedited footage of all the events of the Rabea al-Adaweya sit-in dispersal. This CD was submitted to the prosecution and included footage from surveillance cameras placed at the Rabea al-Adaweya Charity Association, which administers the large mosque in the square. Although the prosecution previously asserted it had received a full, screenable version, according to the court records, it later claimed the CD was damaged. The defendants also demanded that the court include official reports and case documents from both the Republican Guards headquarters clashes, during which 51 people were killed in July 2013, and an attack on Islamist protesters at the Memorial of the Unknown Soldier on Nasr Road, which left at least 72 people dead. They also demanded to repeat testimonial hearings for General Osama al-Saghir and Major General Ashraf Abdallah, and to allow defendants to question them — a right enshrined in Egypt’s Criminal Procedure Code — a request that the court denied. May 5, 2018: The court sentenced Sultan to a year in prison, on charges of intentionally obstructing the trial by knocking on the defendant’s glass cage during the session. May 19, 2018: The court scheduled a date to issue a verdict on May 22. May 22: The court postponed the decision to May 26 to allow defendants to present their testimonies. May 26, 2018: The court postponed the date to issue a verdict to May 29 to continue hearing defendants’ testimonies. May 29, 2018: The court rescheduled the date for its verdict announcement, stating that a decision in the case is expected to be issued on June 30. June 30, 2018: The court postponed the date to issue a verdict in the case to July 28. July 28, 2018: The court issued preliminary death sentences on July 28 for 75 defendants in the case, including Beltagy, Erian and Barr, referring their case files to Egypt’s grand mufti for review before a final verdict is to be issued. It also postponed the date for the announcement of its verdict for the other 664 defendants in the case, including Shawkan and Badie, to September 8. September 8, 2018: The Cairo Criminal Court issued death sentences to 75 Muslim Brotherhood leaders and life sentences to 47 other defendants, including Badie, according to Abdel Rady. The judge also sentenced 374 defendants to 15 years in prison; 23 defendants, all of whom are minors, including former President Mohamed Morsi’s son, Osama Mohamed Morsi, to 10 years in prison; as well as 215 defendants, among them freelance photojournalist Mahmoud Abu Zeid, more commonly known as Shawkan, to five years in prison. The lawyer tells Mada Masr that release procedures will begin for those who received five-year terms due to the time they already spent in remand detention during the trial, and they will remain in probation for five years after their release. He adds that charges were dropped for five others defendants who died during the course of the trial. Why has the case taken all of this time? Between the prosecution’s investigation and the trial sessions, the case took almost five years to adjudicate, according to ANHRI lawyer Ahmed Abdel Latif, who adds that it took the prosecution two years to investigate due to the fact that there were over 700 defendants. The length of time it took to process the case was also partly the result of attempts by Muslim Brotherhood leaders to prolong the trial, in the hopes that a change in the political climate or a reconciliation between the group and the state would occur in the meantime, Abdel Latif adds. Throughout the trial, the prosecution presented a total of 52 CDs of evidence to the court, which took months to screen. However, these technical and bureaucratic issues were not the only factors behind the delay: Lawyer Hoda Nasrallah notes the historic nature of the case, arguing that the government recognizes that the sit-in serves as a symbol for the pro-Morsi movement. Due to the violence committed during the dispersal, the lawyer predicts that the verdict will be reported on worldwide. According to her, the government does not care if the case took almost five years, as it has already committed a violation when it held defendants in remand detention for two years pending investigations.